7mm x 8mm "rosebud" faceted – this bead is molded in a rosebud shape with facets around the middle of the bead. 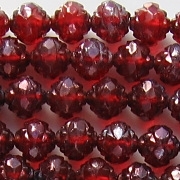 Translucent red with a silvery luster coating; I am certain that the coating is fired onto the beads, so it should be durable. 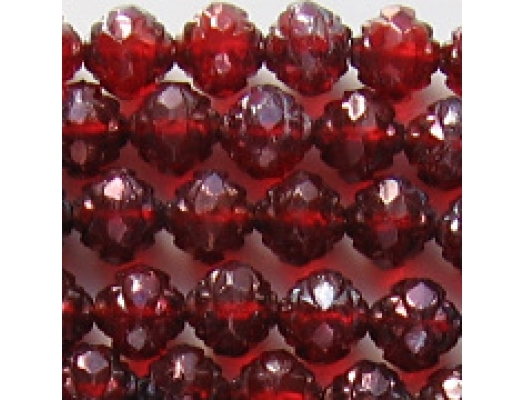 The beads appear to be in good shape, although fire-polished beads do not always have perfect facets. At the window in natural daylight. Please note that the picture is quite a few years old. I haven't replaced it because it is pretty accurate. 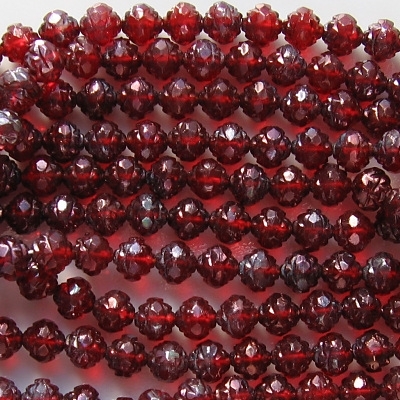 The coating on these beads isn't just lustrous, it is silvery. The supplier calls it a "vega" coating. These beads have always sold well.